What a fun surprise to be able to return to Savage Wells! I liked The Sheriffs of Savage Wells even though it was a bit corny. 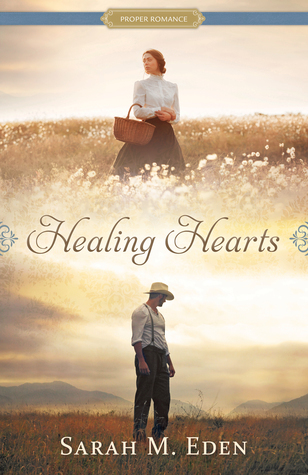 When I heard about Healing Hearts by Sarah M. Eden, a sister book about another character from Savage Wells, I had to get my hands on it. Lucky for me it turned out be about one of my favorite characters. The doctor, Gideon MacNamara, is a favorite in the town and of readers. I liked his character a lot in the first book, so I was excited to read more about him in this book. Even though I lost a little respect for him when I found out he sent for a mail-order bride, he may have done enough after that to gain back some of that respect. “As the only doctor in the frontier town of Savage Wells, Gideon MacNamara knows his prospects for a bride are limited. The womenfolk in town are either too young, too old, or already spoken for. So, being a practical man, he decides to take advantage of the matchmaking service of the day—mail-order brides—and sends away for a woman with nursing experience. When Miriam steps off the stagecoach in Savage Wells, she sees a bright future in front of her. But when the town—and Gideon—meets her, ready for a wedding, her excitement quickly turns to horror. Somehow Dr. MacNamara’s message had gotten turned around. He didn’t want just a nurse, he wanted a wife. When she refuses to marry him, she finds herself stranded in Savage Wells with some very unhappy townspeople. Well, the first thing that comes to mind after reading this book is how thankful I am to live right now—in February of 2019. I’m thankful that “the matchmaking service of the day” is no longer mail-order brides! It might be an internet dating site or a crazy aunt Esmerelda, but thankfully it isn’t mail-order any more. I’m also thankful for vaccinations, medical knowledge, hospitals, and women’s rights. I know that it may not be perfect, but we live in an amazing time, and we’ve come a LONG way! Healing Hearts is written well. I personally think it’s much better written than The Sheriffs of Savage Wells is. It still has a few cheesy parts, but really, what is a romance without those morsels? The writing style of the book just draws you in. From the very first page you just feel connected to the story. It’s descriptive without feeling overdramatic, and simple enough to match the feeling of the time. Don’t get me wrong, although seemingly simple, the story is complex, with several plot lines converging from many places. You have Miriam’s past and present, Gideon’s past and present, along with the townspeople. As the reader, you have the opportunity to meet many of the townsfolk. As you meet them and learn of their stories, it helps you better understand their feelings, motivations, and loyalties. The townspeople and the main characters are well written and well developed. There are a few familiar faces along with a few new faces as well. Some of the new faces aren’t too friendly, but a few of them may surprise you. Miriam and Gideon are so well developed. Miriam is a bit guarded about her past, and it’s understandable when you learn more about her. Gideon takes her guardedness the wrong way and almost ends up destroying their chances all together. Of course we get to see Paisley, Cade, and Hawk again, and that’s fun. I love how they all play off of each other. Their friendship and loyalty are part of what makes them such great characters. At first glance, the story may seem superficial. Man sends for mail-order bride. Bride didn’t get the bride memo and runs away. However, when you get into the story, it’s quite complex and has a heavier feel to it than the previous book. The topics and themes are very weighted and serious. There are some severe and deathly diseases discussed, along with serious mental health issues, which were not dealt with properly in the 1800s. Women’s rights are also right there at the top in this book. I wish it were just women’s pay, or something easier to discuss, but it’s truly about a woman’s right to be herself. To take care of herself.To represent herself.To prove herself.To be a human. Although I liked the ending and thought it came together well, there were a few situations that worked out a little too perfectly. As a reader, I’m glad they did, but it may not be quite as realistic as what would have really happened. It’s also a little predictable. Overall, though, I loved the book. Since I’ve started teaching I don’t have as much time to read as I’d like to, but even with little time, I made time for this book. I finished it in two days because I couldn’t put it down. Now, my dishes and children may have felt a bit ignored, but they’ll live. If you like proper romances, sweet love stories, or medical dramas, you’ll enjoy this book.